I had three beautiful cucumbers come through, 2 of them I harvested this week, but all the new cucumbers are turning yellow and dying when they get about an inch long. What is causing that? I read that cucumbers are suseptable to overwatering, and that you should let them dry out in between deep waterings. I am trying very hard not to overwater, I always wait until the surrounding soil is dry when I stick my finger in it. What am I doing wrong? All my other stuff is doing great! The plant itself shows no sign of distress... tall, green, big leaves..
Maybe they are not getting pollinated. That is exactly what happens when a female flower does not get pollinated. It stays small and eventually dries out and falls from the plant. If you don't have a lot of bees around then you gotta do the pollinating yourself. Get a tiny paint brush and rub the pollen from the male flower then rub it in the female flower. Ir you can just pick off the make flower and remove all the petals and rub the pollen inside the female flower. Yeah I'm thinking it's lack of pollination as well. Had a bunch of those this year. Just pollinate them yourself if bees aren't around. That's what's happening to mine as well! Although, my plant is very small - only about a 16 inches tall and has already started to flower, then it looks like a 1 inch cucumber forming, but then it turns yellow and dies. I could self-pollinate it like I do my corn, but I am new to cucumbers....what is the difference between the male flower and female flower? 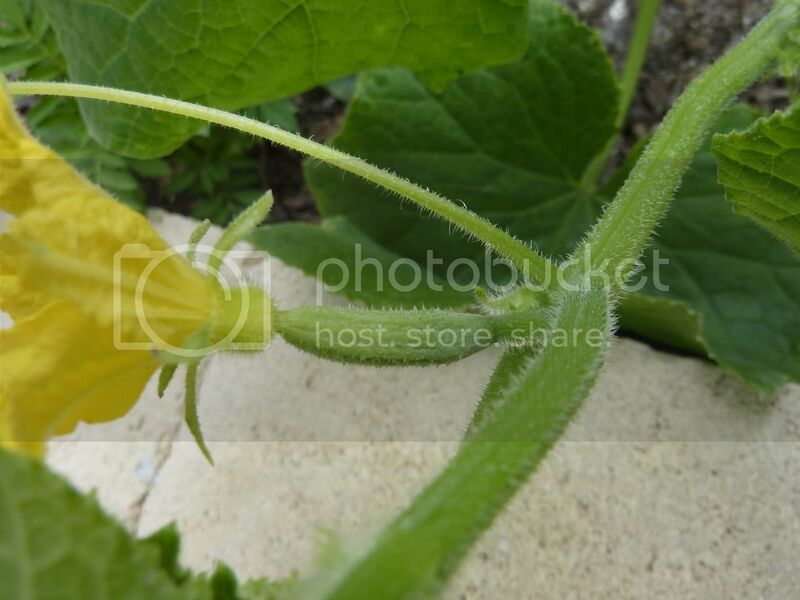 The male cucumber flowers do not have fruit attached to them. The female flowers do. I usually pick a male flower in the mornings and strip back the leaves. I then rub it into the female flowers. I can pollinate four or five female flowers with one male flower. 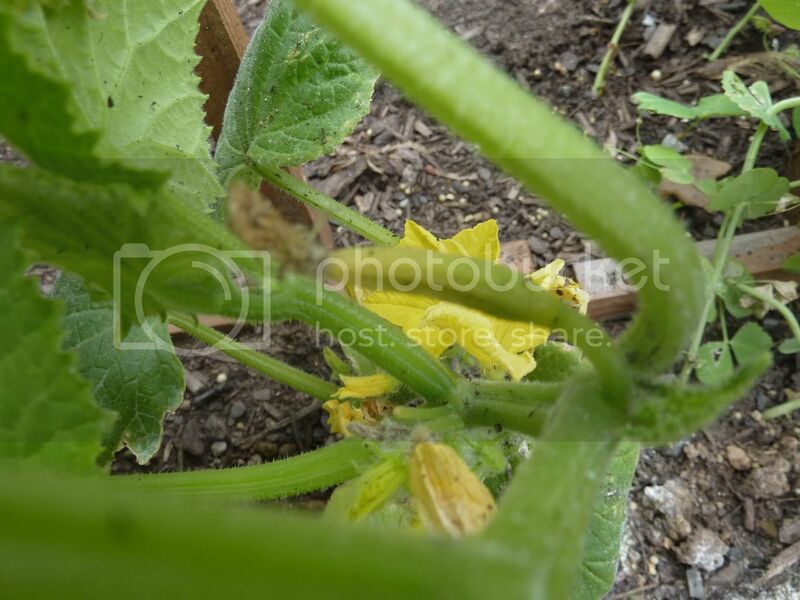 The cucumbers with shrivel and die if not pollinated. After the female flower is pollinated the flower closes up and dries out. 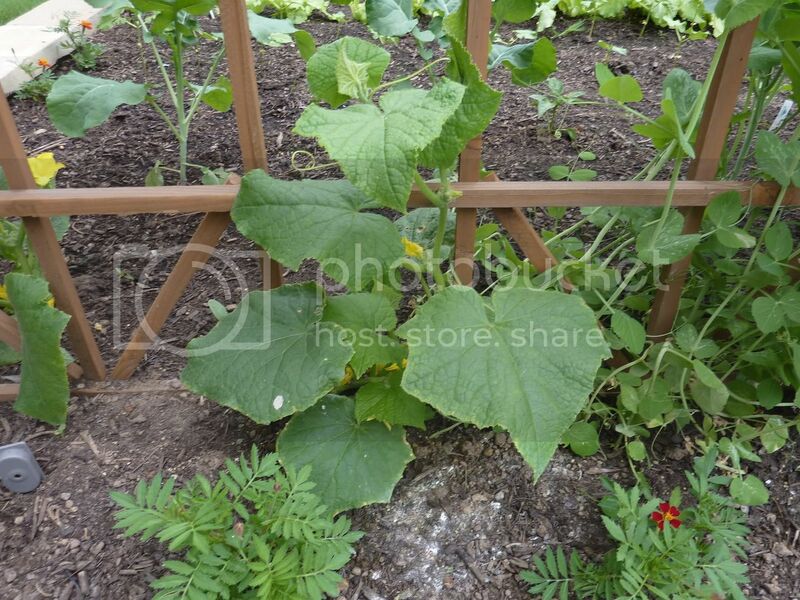 The cucumber than begins to grow very quickly. There is usually a lot more male flowers than females. A female flower will have an ovary, which is basically an undeveloped fruit behind its petals. The male flower is missing this feature. Plus the males will have the pollen, so look at the flowers and once you can distinguish the 2 then you can start self pollinating. Okay, so then just to be sure this is what my problem is...the following picture is of the one turning yellow. Then another cucumber forming - is it too late to pollinate this one myself? And the last picture is of my whole plant - it's really small - should it even be producing the cucumbers now anyway? The part where you said the female flower closes and dries up after pollination confuses me because just like the picture SLC shared, the flower has dried up on the cucumber that is now turning yellow. So how do you know if a flower has closed because it's been pollinated or because it didn't? I don't have any flowers at all right now on that plant. Everything flowered last week and nothing has come up since so I guess I will wait for the next round of flowers before I try the self pollination thing. I have a later bunch of plants that are just getting their first male flowers, but no female flowers yet, so I guess I will wait and see on those as well. 1st pic it is too late, but the 2nd you can pollinate. What variety is your cucumber? It is called, "Tendergreen." I was looking for something that was good for both slicing and eating, as well as pickling, and this was the only variety I could find. All the others I saw were either for JUST eating or JUST pickling. I hope it works! But, I heard that all cucumbers like to sprawl out and take up a lot of room, which is why I am trying to get this one to grow up the trellis. Or is this variety supposed to be small?